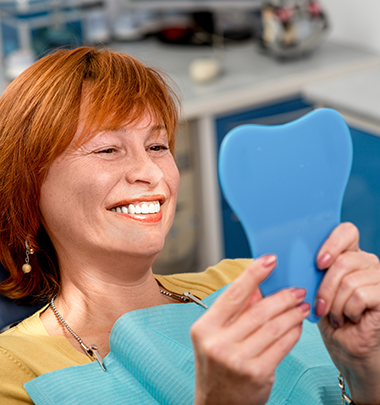 Cosmetic dentistry offered at Littleton Dentures & Implants, PLLC, provides various treatments and care to patients that will help them regain their confidence to smile again. Dr. Nadar, offers Littleton, NH residents premium cosmetic dentistry service. His staff is trained to provide our patients with enough information about the different treatments offered to restore healthy teeth in the Littleton area. Dr. Nadar, not only restores the function of the teeth, but also gives the teeth a youthful, beautiful outward appearance. A number of procedures are available at Littleton Dentures & Implants, PLLC, performed by Dr. Nadar, with teeth whitening being the most common treatment that combat the inevitability of tooth discoloration. This helps restore damage due to natural wear of certain food or staining of coffee and tobacco. Dr. Nadar offers a simple and effective whitening solution that is performed in his office in a safe and long lasting solution that will whiten your teeth and brighten your smile. Veneers, crowns and bridges, implants and dentures all fall within the range of cosmetic dentistry in Littleton, New Hampshire. In the Littleton area, the objective of cosmetic dentistry is to sacrifice the function of patient teeth in favor of appearance but to increase the deftness and subtlety of dental work. While there may be some differences in technique or material, what sets the cosmetic dentistry apart is the high standard for the appearance of work provided to the patient. Cosmetic dentistry at Littleton Dentures & Implants, PLLC does not limit its focus only to the patient’s dental health but works to include the importance of the patient’s confidence in his or her appearance as well. If you’d like to learn more about cosmetic dentistry at Littleton Dentures & Implants, PLLC in Littleton, NH simply give us a call. We’d love to hear from you and answer any questions you may have!